Quiet horror is one of my favorite sub-genres and with that in mind I was looking forward to this release from one of the masters. Admittedly, my expectations for this were high and I'm sorry to report that THIRTEEN DAYS BY SUNSET BEACH didn't meet them. A man, Ray, takes his wife and extended family on vacation to an island in Greece. It's the first time that the entire family has vacationed together and everyone has been looking forward to it. It's not long, however, before they begin to notice strange things. Why are there no mirrors in their hotel rooms? Why are different members of the family having similar dreams each night? Even more intriguing, why are those same family members displaying bite marks on their bodies? You'll have to read this to find out! First, I did like the writing style and quality, and I enjoyed the foreshadowing. (At times, I think the foreshadowing was the only thing that kept me reading.) What brought me down quite a bit was the pacing and some of the characters. I didn't feel much for any of them, other than Ray, the elderly protagonist and Jules, whom I couldn't stand. (Really, I couldn't stand him-a more annoying, fussy, controlling man you couldn't find anywhere.) I hated him enough that I considered quitting this book more than once. Between him and the pacing, I came *this* close. But every time I said to myself "This is it! I'm done!" something happened that kept me going. Overall, I'm sorry to say that this book didn't work well for me. The writing quality is there though, which is why I'm going with 3 out of 5 stars. What doesn't work for me might work exceedingly well for you, so if the synopsis sounds good, go ahead and give it a shot. 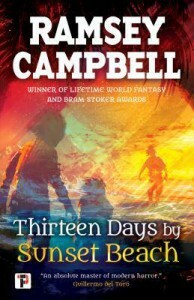 Ramsey Campbell is a master of the horror genre after all!